The plan for me, moving with A to Oslo was, to start studying at the University of Oslo. I didn’t even once spend a thought about requirements or proficiency tests. I assumed my appearance, our story and puppy eyes would be enough to get me enrolled into classes. Sadly, that was not the case. Early September, a couple weeks after we moved to Oslo, I learned that in order for me to start studying at the University of Oslo, I would have to pass the bergenstest first (language proficiency test at University level) and then get enrolled. If I do pass before July 1st, I would be able to start classes in August. That was a huge bummer, having to wait a whole year to continue studying… but maybe, maybe it wasn’t such a bad idea after all to take a year off from classes and just explore the culture, the language, the customs. Yeah, maybe that’s not too bad after all… But then the councilor, whom I spoke to, told me that the next test would take place in the middle of January, which gave me a little less than 5 months to perfect a language (unknown to me) to a degree where I could pass 5 different language parts without any problems. The first part: Leseforståelse. You will have to read a couple pages and then answer some questions about the texts or pick the right word to fill the blank. The second part: Referat. You will have to listen to a 4 minute conversation, write down some important bullet points and then write a one page summary about what you heard. The third part: Lytteforståelse. You get to hear 25 short conversations and have to mark the right answer. E.g. what are they doing? What are they talking about? Where are they? The fourth part: Grammatikk og Uttrykk. 30 sentences A, that needed some kind of change (grammatically or idioms) in sentence B. The fifth part: Skriftlige Produksjon. You write a two-page essay about any given topic. By the beginning of January I was already completely burnt out. All I did was wake up and study, eat, while studying, study and study and study. But was it really enough for the bergenstest? After all, we have only been in Oslo for 5 months and I still had big troubles understanding people when they talked to me face to face, thankfully I wouldn’t have to deal with any of this during the exam, right? Conversational parts that is. So early Saturday, January 14th, I got up, got ready and left for the bergenstest. The test was supposed to be a whole-day gig, from 8.30-15.00 with 30 minutes of a break in between. About 400 people showed up for the test, 20 of them shared a room with me and were given the same instructions I was. Not to talk to each other, not to try to cheat, that kind of business, you know. If we had questions, only ask the supervisors, the usual. And then the testing time started. I felt pretty good about the first two parts, thinking that if it continues like this, I’d pass this easily but then: the listening comprehension. Even if I thought I understood one sentence, it wouldn’t match the answers and vice versa. So I knew, I’d bomb this. In order to pass the bergenstest, you have to pass at least 55% of every part of the test. And being so unsure of every little conversation I had to listen to, I just knew that I basically should study for the next bergenstest already. But I pushed the thoughts away and did my very best. I was done a few minutes before 3 with my entire test and decided to pack up and not look back, what is done, is done. If I failed, I failed, nothing I can change now, right? So yes, I did pass. All parts, even the one where I was sure I didn’t pass. I passed and am unbelievably happy. A said that it was all me, that he didn’t do a thing, that he didn’t help. But the truth is, he did help. Every step of the way, he supported me and he gave me the time I needed to study, he would provide me with food, when I said, I wasn’t hungry and he’d tell me, to eat it anyways, it’d help me. He did everything he possibly could and I passed, not only because of him but because he was and still is here for me. He is the best help I could ever wish for. And without him the feeling of passing would only be half as good. Hi! 🙂 Are you taking the prep course? It helped a lot! They usually give out themes to write about for the referat in the prep course as well, so I did those and then read the newspaper and picked out stuff to write about and had some Norwegian friend proofread it :).The hardest part for me were the listening comprehensions, they were a bit too quick for me… Lykke til!!! I know listening comprehension is very quick. I have some troubles for that part too. Did you get sometime to read the questions before it started? Hi there! just encouraged by your story. I have taken the test once already and didnt pass, I really need to start University so I have to pass the Bergenstest asap. Just wondering, where did you take your prep course? i took one at folkeuniversitet but it wasnt much help. Any advice would help! thanks so much for your post! Hi! I did take the class at folkeuniversitet as well. I took all the papers that we got there and made tons of copies and religiously went through them over and over again and filled them out and compared the answers. Part of the test is unfortunately a know-it-by-heart-procedure. For the reading and listening comprehensions, I did just that, listen to the radio and try to write about what I heard about and read tons in aftenposten. I tried reading books in Norwegian that I already had read in English. I had friends that read through my papers and corrected them and gave me good advice on how to phrase it better. Lykke til! Jeg er helt sikkert at du klare det den neste gangen!!!! Hi, isn’t it enough to pass Trinn3 to get into university? I tok the bergenstest once and didn’t pass, so i tok trinn3 sommerkurs at uio (6900nok) and it was a lot easier to pass and to get good marks (for oral and written exams). And it was enough for me to get into uni with that. http://www.samordnaopptak.no/info/utenlandsk_utdanning/sprakkrav/krav-til-norsk-og-engelsk-for_hoyere_utdannning/index.html yes, it’s enough to take trinn 3, but with the bergenstest you only need the written exam. I don’t know if you need both parts with trinn 3. 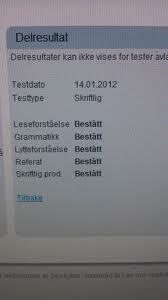 Yes, you are right but both the written and oral exams for Trinn3 are still easier than the bergenstest written exam. Just so you know that you have options. Good luck! Hei. Jeg tok temaet om barnoppdragelse, det var jo veldig allmene teamer som ble gitt og du kunne velge mellom to men jeg husker ikke helt det andre temaet 🙂 lykke til! Hei 🙂 Jeg tror den største forskjellen er at du må ta begge to deler (teori og praksis) for å få norskprøve 3 godkjent, med bergenstesten holder det med teori-delen. Men det kommer litt an hva du vil med testen etterpå. Jeg hørte ikke mye om Skapago, men jeg vet at nettkurs for fagbokforlaget er ganske bra. Jeg brukte de vanlige bøker (på vei, stein på stein og her på berget) men det finnes jo maaaasse bøker! Syntes at jeg fikk mye ut av bergenstesten-forberedingskurs. Lykke til!!!! Hvor mange ord må man skrev for den skriftlig produksjon? Nå spør du vanskelig… Jeg tror at det var 2 eller 3 sider, men mindre og riktig er bedre enn mer og feil. Det viktigste er ikke det du skriver om men at du klarer å skrive om noe og klarer å argumenterer for ditt syn. that was amazing achievement….how many hours you used to read per day? Thank you 🙂 I did read an awful lot (but reading books you like makes it a lot easier…!) and constantly listened to the radio and studied studied studied. Jeg setter pris på deg. Takk for innlegget. Jeg har noen spørsmål. Har du gjort de arbeidsbøkene når du leste Stein på stein, herberget og sånt? er det noen lesestoff du anbefale? hva studerte du i Norge da? Hvorfor foretrekker du aftenposten istedenfor VG? Hei du! Jeg er misunnelig av deg. Hvor mange prosent en må svare riktig i alle delene for å få bestått? 🙂 Det kan være litt morsomt, men skriver man med blyant eller vanlig penn? Takk for innlegget. I tilleg lurte jeg på om har du eksempel tester? Hei! 🙂 Så vidt jeg vet beregner de testen med poeng, men jeg vet ikke helt hvordan de gjør det. http://www.folkeuniversitetet.no/sider/norsk-spraktest/test-i-norsk-hoyere-niva/skriftlig-test/side-id-10159/ her finnes viktig informasjon. Det kan du velger selv hva du skriver med, men tenk på at referatet må være godt lesbar! Jeg har dessverre ikke noen tester, men det finnes jo noen på nettet hvis jeg ikke tar feil! Det som jeg virkelig kan anbefale er bergenstestenkurs, da får du prøvingstester og! 1. Where does the MUNTLIG part stands after passing this test ? 2. How long did it take to complete the Bergens test from Norsk Prove 2 til Bergens test ? Since i am going to attempt Prove 2 after almost 2 weeks, what do you advise ? … I cam to Norway in august n started school for norsk now gona take the test. I think i took a long time for prove 2 what do you thing ? For the university the written test is plenty, they do not require a muntlig part for that. As for your second question, I did not take Norsk Prøve 2, I only took the Bergenstest and that I completed after 4 months of intense training and practicing. I think if you practiced every day and are doing fine in conversational Norwegian, you should be fine! Just stay confident and I am sure you will pass!!!! Lykke til! Hei, hvor mange timer brukte du daglig for å lese til Bergenstest? Jeg lurer veldig på. Skal ta Bergenstest og jeg ikke hvor mange timer må jeg studere til det. Det er et veldig godt spørsmål. Jeg hadde veldig mye tid, så jeg har lest mellom fire og fem timer på norsk daglig. Men det kommer alltid an på hvor mange måneder tid du har før du skal ta bergenstesten. Det er viktig å trene norsk når du er ute og handle og gjør daglige aktiviteter. 🙂 Lykke til! Jeg har BT i april og har ikke lest så mye til nå. Jeg er kjemperedd for testen. Det er kanskje fem uker igjen. Så mye du vet om vanskelighet fra eksamen, hvor mange timer anbefale du meg å lese? Jeg anner ikke hvor skal jeg starte. Jeg har meldte meg på Bergenstest kurs fra Folkeuniversitet i tillegg. beklager at det tok så lang tid å svare. Det er vanskelig å si hvor mange timer du skal lese, du må nok være i stand til å lese en tekst og forstå sammenhenger. Det kurset kan jo bare anbefales, der får du vite om du klarer deg i eksams-situasjonen. Det viktigste er at du stole på deg selv, da klarer du det helt sikkert! Lykke til, nå er det bare noen få dager til, ikke sant? angles. Its like women and men aren’t involved unless it’s one thing to do with Lady gaga! Hey POLAR LOOP ACTIVITY TRACKER- You can read how I passed the test. You can get free materials. Hello abirdlovesfish, What a motivation you are! I was motivated by your blogg and followed your steps and passed bergenstesten. I’m very thankful. And now it’s my time to motivate and help others. I blogged about the test wanted you to direct people to my blogg if they want helping materials(example test and books on pdf) and stuffs on pdf. I’m willing and able to share it. I’ve even mentioned you in my post.Here is my site https://bergenstesttips.wordpress.com/ . Thank you so much.